Spring: a time of new beginnings and fresh fashion looks. As beautiful flowers bloom and grow, so can your wardrobe with the latest spring 2018 fashion trends! Dressing yourself is a fun exercise of self-expression. It is so exciting to let your true colors shine through by wearing outfits that make you feel happy and unique. Check out the latest spring fashion trends, and choose to adopt the looks that fit your style! 1. Sheer: Sheer is a perfect fabric to layer with other clothing items for an appealing look. Any type of see-through material is in style right now, as long as there is a solid clothing piece underneath. Just layer a cute sheer top over another top that isn’t sheer for a spunky spring look. You can even layer a sheer top over a trendy dress. Or purchase a sheer skirt and sport that over your favorite pair of shorts. 2. Denim on denim: Pair different denim styles together — dark indigo, stonewash, light wash, etc. 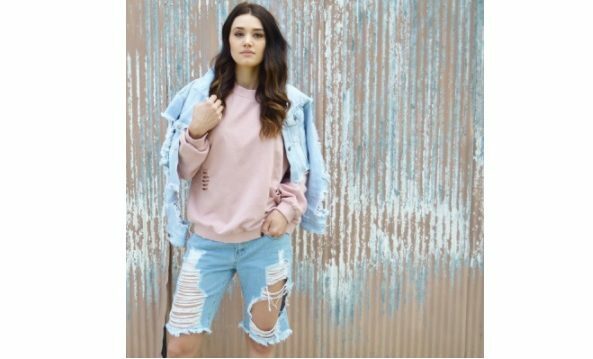 The classic denim jacket has always been a popular spring style, but now it’s acceptable to pair that denim jacket with jeans plus even another denim accessory like a hat or bag! 3. Metric shapes: This season, geometry is back in session! Spice up your wardrobe by adding in a top with triangles, squares, and circles on it. Modern polka dot styles are really in. Don’t limit your metric shapes interest to just clothing pieces- you can’t go wrong with a statement bag that has bright colored shapes on it. Not sure what to wear on your next date night? Seek out a dress with metric shapes on it! 4. Trench coats: For those slightly chilly spring days, throw on a fashionable trench coat. These coats are able to be paired nicely with relatively almost any outfit. There are many different colors and styles of fashionable trench coats as well. With the unpredictable spring weather, sometimes it is difficult to decide what jacket is suitable for the day. Trench coats offer the perfect amount of warmth for a typical spring day. 6. Really bright colors: I mean really really bright colors- yellow, orange, pink. What better way to embrace the bright spring colors that nature has to offer than wearing these colors as well! This bright color fashion trend is also collaborating with the gingham print fashion trend. Gingham print is typically worn as just black and white but now designers are adding bright colors into the print. Which of these trends do you want to try out this Spring? Comment below!